If you’ve been fortunate enough to have seen Savage Messiah over the past year or so, you will more than likely have been struck by not only their musicianship and energy, but also by the professional stage presentation which they have clearly spent some time thinking about and investment. They’re a band that have long been a favourite of listeners of ‘The Classic Rock Show’ who, like me, “get” what they do. And so it was when they played Colchester Arts Centre recently as tour support for Amon Amarth (who also brought Huntress along for the ride too), when they brought their Heavy Metal sound (for they are certainly not a Thrash Metal band) to Essex. Colchester Arts Centre – the site of a 13th century church – happens to be one of my favourite music venues. Despite its relatively cramped accommodation backstage, I have yet to hear any negativity from bands/crew as both Lighting and PA wise, it’s highly spec’d and offers bands, and most importantly their fans, a great experience. Given the reaction they got from the crowd that night, and throughout the current tour with Amon Amarth for that matter, Savage Messiah are continuing to win over new fans with their highly polished performances which have been complimented by the brand new back drop and stage-side artwork panels. 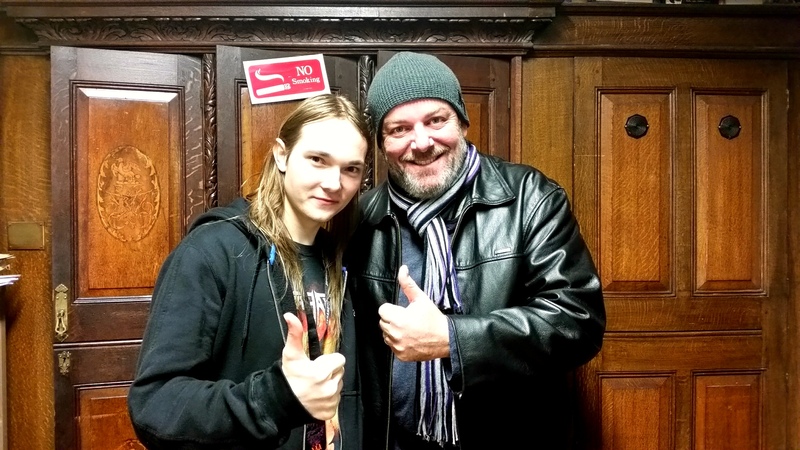 It was only when I met up with Dave Silver, Joff Bailey, Andrea Gorio and Mira Slama prior to the gig, that I was informed that it would be Mira’s, the Czech bass player, first ever press interview! MJ: Mira, welcome to The Classic Rock Show. MJ: The lads have told me that this is your first interview? MS: Yes, that’s right. So, I’m just a little nervous! MJ: Well, there’s really no need to be. 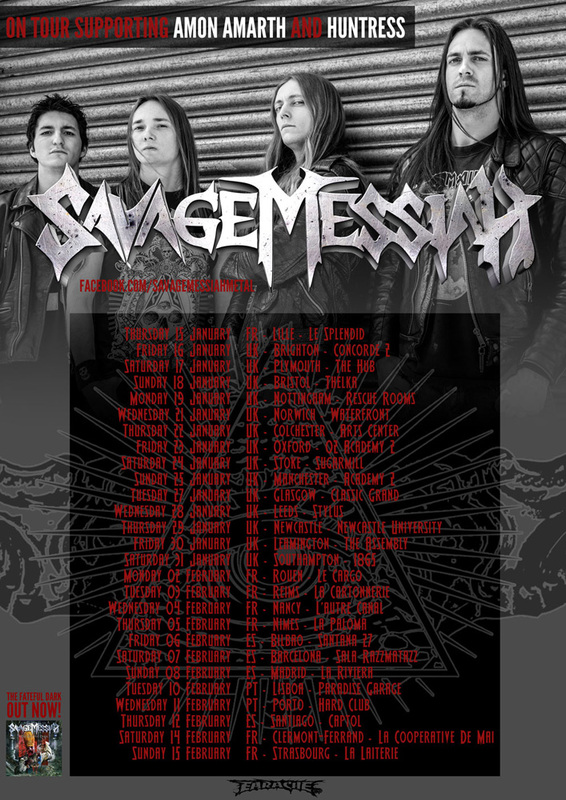 MJ: The last time we met was at the Cambridge Junction in March of last year (2014), on the eve of the release of Savage Messiah’s The Fateful Dark album. It’s been quite a year for you all since then and the reaction to you joining the band has been so positive. You’ve also just released ‘Cross Of Babylon’ as a single which is taken from the album released through Earache Records. MS: Yes, there have been great reviews and although I wasn’t recorded on the album, I’m very happy to be part of the touring. Actually when we all met up at the Cambridge, that was my first show with the band and I was sharing the stage with Soulfly! It was very great tour. So, all the positive things we’ve been getting from fans regarding the album is very good. Hopefully the next one is going to be even better. MJ: You toured consistently throughout last year, nominations for music awards, plenty of airplay on tv and radio…Savage Messiah is a band that was in everybody’s eye’s and ears. I guess you’ll be determined to continue that into 2015? 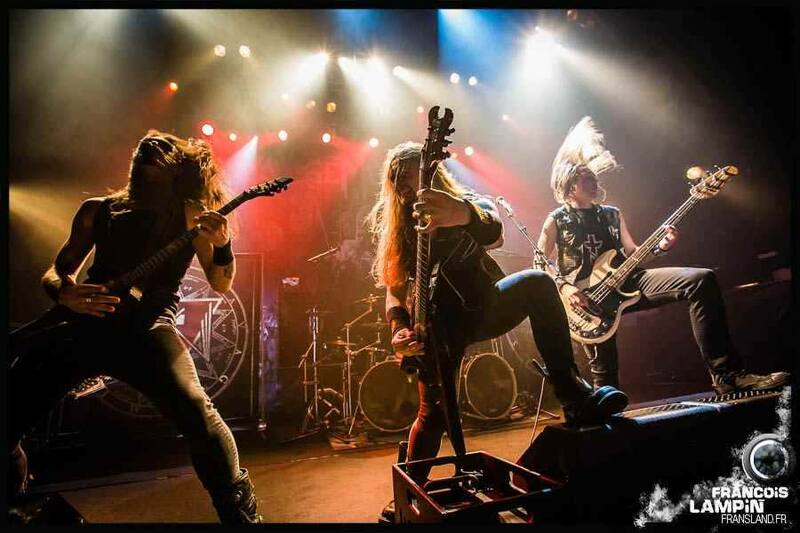 MS: For now we just have this tour with Amon Amarth and co-support Huntress. We’re looking forward to some festivals, including one in my home country of Czech Republic and headlining a next European tour would be good. So hopefully 2015 will be even better than 2014 which was successful. MJ: Tell us about this current tour with Amon Amarth. MS: It’s been going really well. I think almost all of the shows were sold out, so this year is very good tour. Once we finish in the UK, we’re going to France, Portugal – the first time for me – and also Spain. The venue at Barcelona is quite big, but all of them are over 1,000 to 2,000 people. Hopefully it’s going to be sold out in Spain and Portugal too. That would be great. MJ: I’ve noticed that your bass rig has changed since I last saw you in March? MS: Yes, that’s very true. I got an endorsement from Gallien-Krueger which I’m really happy about. I have 410 Gallien Neo Cabs and 1001 RB Heads. It’s amazing sound, you know, so I’m very happy with that. As for the bass guitar, I’m using a Yamaha bass and also I have a Fender bass, but I want to get a custom Yamaha bass for hopefully next year. MJ: Tell us a little bit about the current set list and how you’ve built that up since the release of the Fateful Dark. MS: We’ve been playing mostly the songs of the Fateful Dark because we think they work great live, they get great choruses, they are quite catchy, I would say. And we try to put some new songs in the set list, but not on this tour. So, on the headline tour later on this year we should be playing some new songs. We’ve been playing, actually writing a new album. MJ: You’ve been writing for the new album. What progress has been made, as far as that’s concerned? MS: We’ve been channeling some ideas, putting some songs together. We’ve got about four or five songs which I think all work really good. And, it’s kind of similar to Fateful Dark but there’s a lot of light and shade, but definitiely it’s a Metal album. MJ: And of course this is obviously an opportunity for you to express your bass style. MS: Well, my style, you may recognize, I’m a big fan of Steve Harris and Cliff Burton, so that’s kind of my sound and I’d like to put that into the new album. I’d really like to do some bass intro, starting a song. MJ: Thank you so much for chatting with us on The Classic Rock Show and good luck with the tour! MS: Thank you so very much. Can I just say a big “Thank You” to the fans who I’ve met since joining the band. You guys are awesome! Hope to see you again very soon. ← NEWS: ‘Back To The 80s’ Part 3 – Classic Rock from 1982!